Can you guess who designed the house in the picture above? Yes, I know it’s just ruins. But you can tell that it has an octagonal room, and Palladian features. Other hints: (1) it’s 15 miles north of Charlottesville, Virginia; and (2) it was begun in 1814. If you guessed Thomas Jefferson, president of the Andrea Palladio fan club, you’d be right. 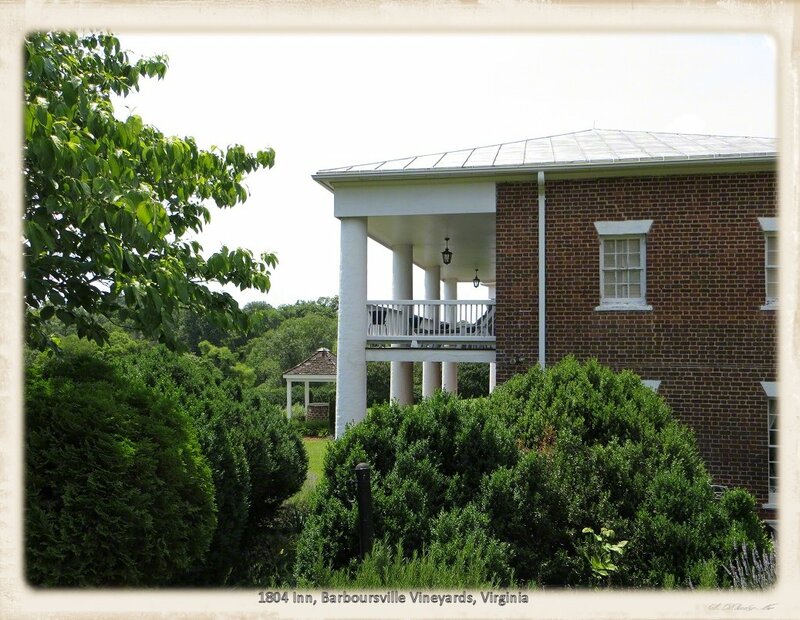 Jefferson designed the house, Barboursville, for his friend James Barbour, governor of Virginia, a U.S. Senator, and John Quincy Adam’s Secretary of War. The Barbour family lived there from its completion in 1822 until it burned down, on Christmas Day 1884. Its ruins are on the National Register of Historic Places. The Barboursville property now belongs to Gianni Zonin, owner of Italy’s largest wine-making group, and is part of his Barboursville Vineyard complex. Zonin, a member of a family that has been making wines since 1821, started Barboursville Vineyards in 1976. George Washington at Mt. Vernon and Thomas Jefferson at Monticello both tried to grow wine grapes, but were unsuccessful. Turns out that American grapes don’t make good wine and European grapevines are no match for Antarctic locus flies — sap-sucking insects that feed on the roots of vines. It wasn’t until the late 19th century that grape growers found that they could graft European vines onto locus fly-resistant American roots for a successful wine grape crop. Too late for Washington and Jefferson, but not too late for Virginia’s booming 21st century wine industry. 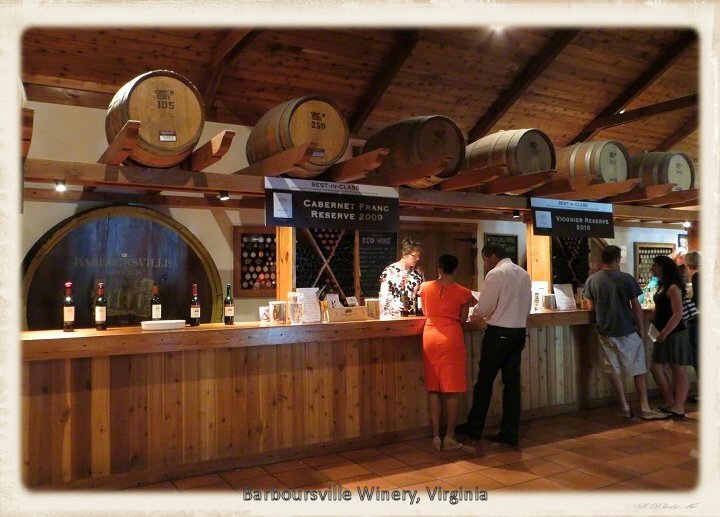 Barboursville Vineyards is about 10 miles south of Montpelier. We — my fellow history tourist Kathie and I — had driven from the DC area in the morning and trapsed through Montpelier through much of the afternoon. So what better way to end the day, we thought, than by sipping a little wine while wandering the ruins of a Jefferson-designed mansion. My very first History Tourist blog post was about an aborted Valentines winery weekend, when my husband and I ended up at Manassas instead (because nothing says romance like a Civil War battlefield). So this was my first wine-tasting experience. The wines were good, but I found the tasting experience boring and not one I’d rush to try again. A more interactive staff might have made things more interesting but the Barboursville crew, while very pleasant, were not a particularly engaging bunch. 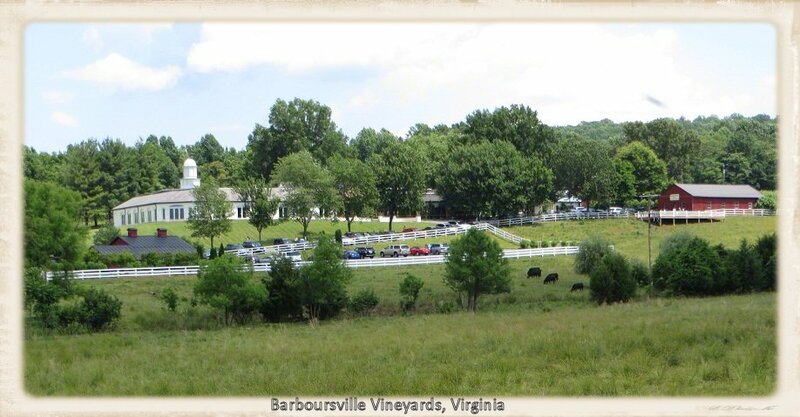 The wine tasting fee at Barboursville was $5. They handed us souvenier wine glasses and told us to start at our right and work our way down the bar. They had over twenty wines set up — you start with the whites, then go to reds, then sweets. Pour, drink, rinse. Pour, drink, rinse. We gave up about half way, but not before I found a 2010 Barbera Reserve to take home. There’s also a world class restaurant attached to the winery. Ater the tasting, we toddled over to the ruins for a look around. It was the Zonins who secured the ruins and opened it to tourists. They stand next to another Barbour home, built in 1804, where the Barbour family lived before Barboursville was built and after it burned down. The 1804 house now is run by the winery as an inn, except when the Zonins are in town, when it becomes their private home. No non-guests allowed on inn property, so I took a shot from the ruins. We took the free winery tour, where we were told about growing and grafting and how the house burnt down. They think that candles on a Christmas tree lit some curtains on fire, while the attendant went to the kitchen to check on Christmas dinner preparations. No one was hurt, and the family moved back to the house next door. Thomas Jefferson intended the octagonal room at Barboursville to have a dome, we learned, and was annoyed when Governor Barbour built the room without one. When Thomas Jefferson designs you a dome, he expects a dome. Barboursville literature says that it was one of three houses Jefferson designed for friends, but I haven’t been able to find what houses or who the other two friends were. Do any of you know? 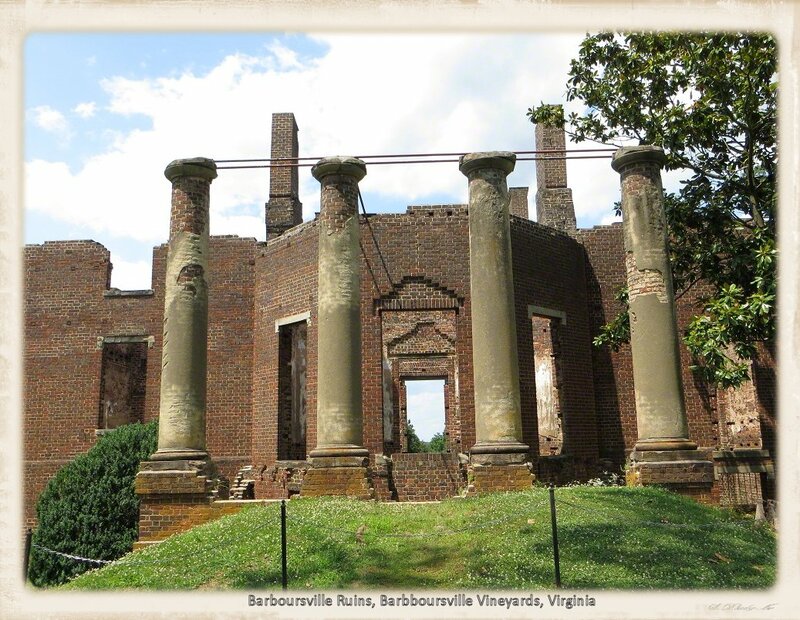 Gallery | This entry was posted in Virginia and tagged Barbour, Barboursville, ruins, Thomas Jefferson, vineyard, winery. Bookmark the permalink. to be designed by Thomas Jefferson”. But other than that I couldn’t come up with anything. Thanks. That’s more than I found. I like that ruin photo, great impact. The wine tasting sounds a bit mechanical. I think I would have got bored with that process. Easier to just sit down with a bottle and relax. Did you not sample the world class restaurant? Re architecture, just been reading the virginiaplantation about belle grove, and had to laugh at the excessive porticos and columns, and then read in the post about them being added on later. So reminded me of your comment about Hampton. Sadly, did not sample the world class restaurant. But I’m definitely planning on going back to try the restaurant and stay at the inn.